It’s all-Marvel (and mostly kvetching) this week at your number one site for Golden Age Aquaman history. Here’s what I’m looking at this week. DEADPOOL #1000 – If anyone deserves to mock the recent spate anniversary issues, I suppose it deserves to be Deadpool, who has turned into the Marvel U’s answer to Ambush Bug. Still, in light of Marvel’s creative accounting when it comes to tallying up issue numbers, they’re shining The Harsh Spotlight of Truth (TM) on themselves more than the industry. GORILLA MAN #2 (OF 3) – I’ll take a new tack this time around. Rather than talking about the genius of Jeff Parker, I’ll talk about the genius of Ken Hale, the Gorilla Man. It would be all-too-easy to turn him into a despondent, woe-is-me reluctant hero, a la Ben Grimm. Instead, we get a funny, action-seeking hero who has embraced the reality of his situation and seeks to make the best of it. Parker’s look at the origin of Hale shows us that his life was never easy, but he has the strength of character to best of his situation. Also, the art is PURTY. MARVELMAN FAMILYS FINEST #2 (OF 6) – When the first issue came out I was very excited to get the chance to read some classic Marvelman, but when I actually picked it up (just before setting it right back down) on the stands I was disappointed. For $4 Marvel reprints these stories in black and white on the cheapest newsprint I’ve seen in a comic in a long time. A cynical man would say Marvel figured anyone who actually cared to pick this up would do so regardless of cost or production values, so I should probably just be relieved they didn’t throw in 3 pages of text by Bendis and charge $5. SHIELD #3 – Fortunately, Marvel saves some face with the new SHIELD book. I’m not entirely sure what the point is, but the ride so far has been worth it. While I’m on the topic of Jonathan Hickman books, I’ve been filling in the gaps of his Fantastic Four run. I was particularly impressed with his first arc, “Solve Everything,” featuring the ultimate team-up of the Reed Richards’ of the multiverse, but every issue seems to top the one before it. It’s fun, adventurous, and scientific; pretty much everything an FF book should be. Last week’s issue kicks off what looks to be a pretty massive time travel arc, and the only quibble I can find is that it’s occasionally hard to tell the bearded characters apart. Don’t forget to stick around for the letter page, featuring Franklin and Val. Well, that’s it for me. What are YOU looking at? Thanks to everyone who came by to check out my piece on cover prices this weekend, and especially to everyone who’s commented. I hope we can make quite a conversation out of this. As for this week’s comics…Well, there’s not much of note this week. And most of the noteworthy books are pretty pricey. Still, let’s dive in. ASTRO CITY SILVER AGENT #1 (OF 2) – I’ve resolved to start talking more about Astro City. Maybe I shouldn’t since I don’t have a full run (or even most recent issues), but I know enough to remember that Silver Agent was Astro City’s greatest hero. It will be very cool to see him, even if for only 2 issues. BATMAN #701 – More Morrison, that’s all I care about. GORILLA MAN #1 (OF 3) – I can’t believe we had to wait for The Uranian and Namora to get their own books before Ken Hale, the Gorilla Man and hands-down greatest Agent of Atlas, to get his. STUFF OF LEGEND THE JUNGLE #1 (OF 4) – The first Stuff of Legend book was terrific, and I’m glad to see there’s more on the way. Highly recommended if you’re looking for something different. the Joker and Robin). This book was superbly done, and a lesson to anyone still writing 6-issue arcs of Batman versus generic gangsters. I’ll close this week on a sad note, the passing of Harvey Pekar, of American Splendor fame. His was truly a unique voice in comics, and one that will be missed in comics. Update: Yes, I stole this from this post over at Comics Alliance. I’m not proud. And I think it looks awesome. Sorry this week’s batch is such a Sims-fest, but he’s put out a lot of great stuff this week (on the other hand, I appear to be having a slow month). Blackest Night in 60 Seconds is EXCELLENT! 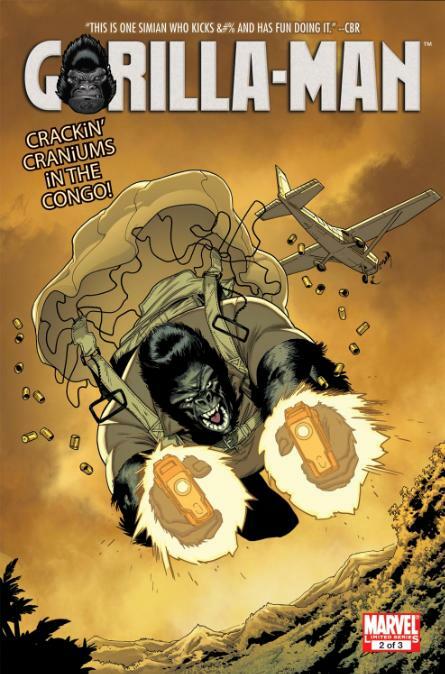 Gorilla Man’s getting his own mini-series! While I’m at it, here’s a reminder that you can help out the L.E.M.U.R. Comic Blog this month (without spending any money)! Go to our Street Team page and download our L.E.M.U.R. Comics Blog bookmarks, and ask to leave them behind at any or all of the comic shops you frequent. Free Comic Book Day is right around the corner and it would be great to have fliers up when comic shops are going to have the most customers coming in. Matt and I both thank you for your support. Leave a comment Posted in Agents of Atlas, Apes in comics, Links Tagged Batcaves, Gorilla Man, If I love Chris Sims so much why don't I marry him?